Universal Banner Manager is a powerful banner manager for your websites. It handles unlimited number of banners, allows to sell banner spots directly to advertisers, supports multiple payment gateways (PayPal, Payza/AlertPay, Skrill/Moneybookers, Authorize.Net, InterKassa, EgoPay, Perfect Money, BitPay and Stripe) and can be easily integrated into any website (no more difficult than insert Facebook Like button, check out steps 5-6 in “Installation” paragraph). With Universal Banner Manager you can easily manage all banners, located on all of your websites, from one place. 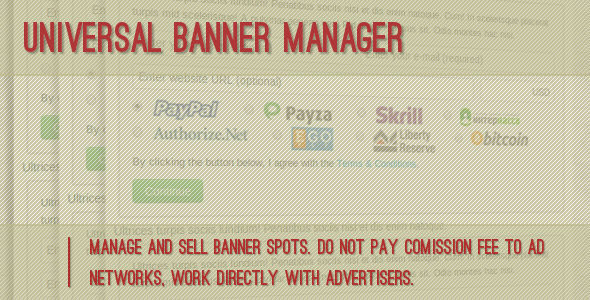 Universal Banner Manager is the easiest and perfect way handle banners and monetize your website. You don’t have to pay any commission fee to ad networks, because now you can work directly with advertisers. Handle banners on website: use this script to handle banners. Multiple payment gateways: PayPal, Payza/AlertPay, Skrill/Moneybookers, Authorize.Net, InterKassa, EgoPay, Perfect Money, BitPay and Stripe. Unlimited banner types: handle (create, edit, delete, block, unblock) unlimited number of banner types. Flexible banner sizes: script has 8 preset banner sizes and allows to set custom banner size. Banner statistics: script sends statistics (number of shows, click, CTR ) to advertisers.